Or, as we like to call them here in The Canada: pencil crayons. may be the single biggest stroke of genius I have ever had. What happens when a child finds a stray coloured pencil on the floor? THE CHILD CAN PUT IT AWAY INSTANTLY WITHOUT HAVING TO GUESS WHICH SUPPLY CADDY IT BELONGS TO. What happens when we are doing a lesson where all the children will need a green pencil at the same time? THERE ARE ENOUGH GREEN PENCILS RIGHT THERE IN THE BASKET. No digging. See, you’re thinking about it now, aren’t you? Also, when they need to change colours, they’ll have to GET UP AND WALK, and we all know movement is good for their brains. Now someone please tell me that things like a rainbow of pencil crayons, and shiny new supplies lined up in pretty boxes, make you as happy as they make me. Or, you know, just tell me I am a very special sort of geek. It won’t be the first time I’ve heard that. Coming this weekend: more photos of my classroom (before the children and their glorious messes arrive), and a new Ask Miss Night column. I promise. 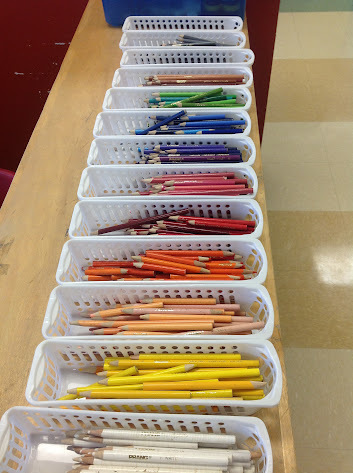 Yes,we take special delight in colour coding in Kindergarten! I bought a lazy susan from Goodwill, and upcycled it into a caryon holder. You know you have “it” bad when not only do things have to be sorted but you sing the rainbow song in your head to make sure that they are sorted according to nature! I actually referenced a colour wheel to be on the safe side! I. LOVE. IT. It makes me want to be 5 again and come to your classroom. Or just come as 32-year old me. Good luck this week, Amy! Welcome to the club : ) Starts with coloured pencils then paper. Before you know it you’re having the kids sort the constructions toys … at the moment I’m pondering how best to organize the lego! As well as getting the chn moving (an advantage I had never thought of- thanks for pointing that out!) it helps them to think about what their purpose is and what tool will be best for the job “Hmmm -light blue …dark blue … bluey purple maybe?” I used to separate shades and had a gorgeous colour palette of shades in several different media. Here in Japan I have less space so have had to rein it in a bit. Just pencils and crayons, only some shades separated. Thinking a tackle box or tool box might be good for lego. Good idea to look on Pinterest. I’m inspired! Thanks! Love it! I used to have a set up like that, but not enough shelf space now … But I’m not finished setting up so maybe. I do have paper sorted by color in my art center. Love your table caddies. Frustrating when good stuff is discontinued. Love this idea! I was going to hunt out some new pencil pots for the tables, which normally have the coloured pencils in too, but this is way better, so now I’ll hunt out pencil crayon baskets too! You’re not alone. I like my pencil crayons colour coded. And my paper colour coded. Let’s hear it for the special sort of geek! oooh, I love the paper thing! I think I saw something like it on pinterest and then forgot all about it. Am totally doing that now, too!